United Rentals is reporting record fourth-quarter 2018 earnings pushed by a 20.8 percent jump in rental revenue growth over 2017 as an increasing tide of customers see the benefits of renting versus owning. 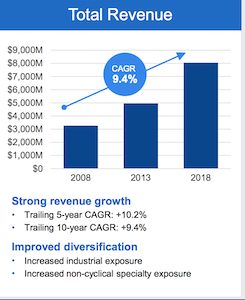 Owned equipment rental revenue for United Rentals increased 18.8 percent thanks to a 16.8 percent rise in the volume of equipment on rent and a 2.2 percent gain in rental rates for 4Q 2018. For the full year of 2018, total revenue increased 21.2 percent to $8 billion, and rental revenue increased 21.4 percent to $6.9 billion, both of which set company records. That momentum is expected to continue through 2019 as the rental market grows, including specialty rentals, says United Rentals, the world’s biggest equipment rental company. For 2018’s full-year results, investors saw record earnings on capital invested, as measured by the Return on Invested Capital (ROIC), which is a profitability or performance ratio. That’s compared to compared with 8.8 percent ROIC for the year that ended December 31, 2017. “Our momentum in the quarter gave us a strong start to 2019, when we expect to once again outpace the industry,” Kneeland says. Net cash provided by operating activities was $2.853 billion. Free cash flow – excluding merger and restructuring related payments – set a company record at $1.334 billion. The company generated $186 million of proceeds from used equipment sales. It also made big gains in its strategy, featuring acquisitions, since the spring of 2017. The company completed the acquisitions of NES Rentals Holdings II, Neff Corporation, BakerCorp International Holdings, and Vander Holding Corporation and its subsidiaries (“BlueLine”) in April 2017, October 2017, July 2018 and October 2018, respectively. NES, Neff, BakerCorp and BlueLine are included in the company’s results subsequent to the acquisition dates. Pro forma results reflect the combination of United Rentals, NES, Neff, BakerCorp and BlueLine for all periods presented. The acquired BakerCorp locations are reflected in the Trench, Power and Fluid Solutions specialty segment, according to a press release. United Rentals has said it expects 2019 to bring it yet more growth as it continues to expand its specialty business and build out organically with acquisitions. As more contractors realize the value of renting vs. owning, United Rentals has transformed to become more efficient and profitable, and it’s generating a lot of free cash flow, they say. Aside from expanding its footprint through strategic acquisitions, United Rentals is focusing on continued growth and competition through its digital and technology developments – as well as by recognizing customer challenges and then providing solutions. The size of the rental fleet was $14.18 billion of original equipment cost as of December 31, 2018. That’s compared with $11.51 billion as of December 31, 2017. The age of the rental fleet was 47.9 months on an OEC-weighted basis at December 31, 2018, compared with 47.0 months at December 31, 2017. Rental revenue increased 20.8% year-over-year. Owned equipment rental revenue increased 18.8%, reflecting increases of 16.8% in the volume of equipment on rent and 2.2% in rental rates. Pro forma rental revenue increased 8.5% year-over-year, reflecting growth of 4.3% in the volume of equipment on rent and a 2.4% increase in rental rates. For the company’s specialty segment, Trench, Power and Fluid Solutions, rental revenue increased by 50.7% year-over-year, including an 18.8% increase on a same store basis. Rental gross margin decreased by 230 basis points to 45.2%. The decrease in rental gross margin was primarily due to the impact of the BakerCorp acquisition and an increase in lower-margin fuel and re-rent revenues primarily within the Power and HVAC region. The company generated $186 million of proceeds from used equipment sales at a GAAP gross margin of 44.1% and an adjusted gross margin of 51.1%, compared with $172 million of proceeds at a GAAP gross margin of 39.0% and an adjusted gross margin of 57.6% for the prior year. The year-over-year decrease in adjusted gross margin was primarily due to the impact of selling more fully depreciated fleet acquired in the NES acquisition in the fourth quarter 2017.